The Southern duo of Shelbi Dailey (23) and Jaiden Roberts trap Wahama’s Hannah Rose during the first half of Thursday night’s TVC Hocking girls basketball contest in Mason, W.Va.
MASON, W.Va. — The difference came down to execution. Visiting Southern made a 27-19 run over the final 13:18 of regulation and claimed its first win of the season Thursday night following a 52-44 decision over the Wahama girls basketball team in a Tri-Valley Conference Hocking Division matchup at Gary Clark Court in Mason County. 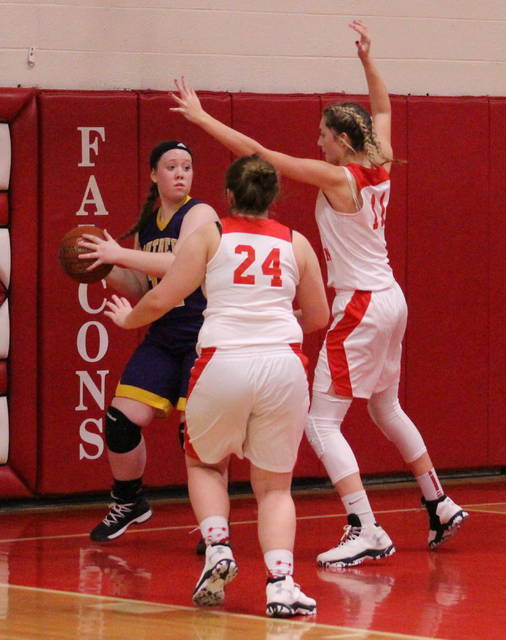 The Lady Tornadoes (1-4, 1-3 TVC Hocking) and Lady Falcons (1-3, 0-3) battled through eight ties and seven lead changes through three quarters of play, but the guests never trailed in the second half after taking a slim 25-23 cushion into the break. The Red and White opened the third quarter with a Harley Roush basket that knotted the game up at 25-all with 5:31 remaining, but Phoenix Cleland converted an old-fashioned three-point play 13 seconds later — and the Purple and Gold never trailed again. In fact, Cleland’s goal sparked a 9-4 run and the hosts committed 13 turnovers while producing only six shot attempts as Southern took a 34-29 edge into the finale. Roush again scored the opening bucket of the fourth to whittle the lead down to a single possession with 7:04 left in regulation, but the Lady ‘Does shot 50 percent from the field down the stretch and led by as many as a dozen points (52-40) with 25 seconds remaining. Wahama reeled off four straight points over the final 13 seconds to wrap up the eight-point outcome. Southern outscored the Lady Falcons in each of the four quarters, but never led by more than two possessions until the final period of play. 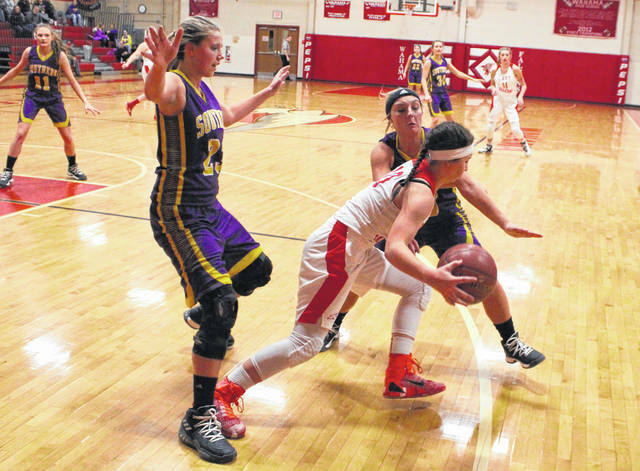 Wahama outrebounded the Lady Tornadoes by a slim 33-30 overall margin, but the guests claimed a 14-12 edge on the offensive glass and also had one less turnover (23) than the Red and White (24). In the end, however, it was the group effort that ultimately allowed first-year coach David Kight to pick up his first victory at Southern. Following the game, Kight — who formerly served as head boys basketball coach at both Pike Western and Meigs — was pleased to see all of his troops’ hard work pay off in the end. “I told the girls in the locker room that I am extremely proud of them. They have no idea how ecstatic I am for them to get their first win,” Kight said. “It’s been a process since day one to get to this point, and it will continue to be a process throughout the year … but we are seeing improvement every day. Conversely, WHS coach John Arnott was disappointed with the way things turned out — primarily because his squad was facing a two-possession deficit (39-33) with 5:24 left. And despite committing only two turnovers in the fourth quarter, the execution that was needed down the stretch just never came to fruition. The Lady Falcons have now dropped 72 consecutive TVC Hocking contests, dating back to a 53-48 home win over this same Southern program back on Jan. 14, 2013. The Lady Tornadoes never trailed in the opening canto, although the game was tied on six different occasions over that span before the guests claimed a 16-15 edge. Wahama led by one point on three different instances in the second frame, the last of which came at 21-20 following a pair of Hannah Rose free throws with 1:44 left in the half. SHS closed the quarter with a 5-2 run to take a two-point cushion into the break. Southern connected on 19-of-50 field goal attempts for 38 percent, including a 2-of-3 effort from three-point range for 67 percent. Both SHS trifectas also came in the fourth quarter, which included a pivotal dagger from Paige VanMeter at the 1:46 mark that gave the guests their first double-digit lead of the night at 46-36. Lauren Lavender led the Lady Tornadoes with a game-high 18 points, followed by Jaiden Roberts with 11 points and Cleland with eight markers. VanMeter was next with seven points and Jordan Hardwick completed the winning tally with two markers. 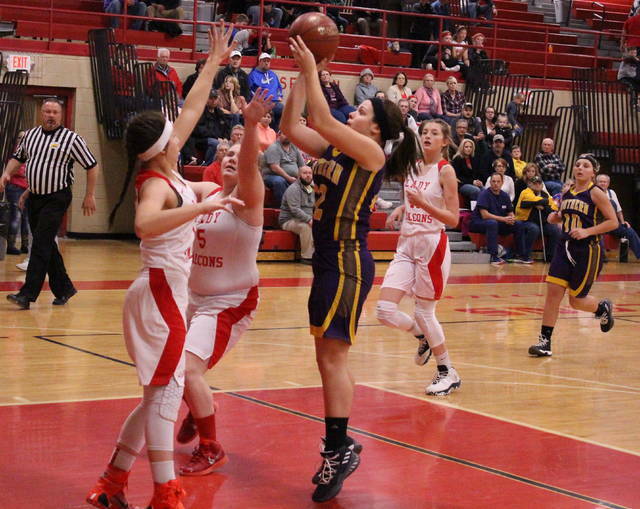 Baylee Wolfe hauled in a team-high eight rebounds and Shelbi Dailey grabbed six boards for SHS, which finished the night 12-of-23 at the free throw line for 52 percent. The Lady Falcons made 17-of-49 shot attempts for 35 percent, including misses on all four of their tries from behind the arc. The hosts were also 10-of-20 at the charity stripe for 50 percent. Emma Gibbs paced the Red and White with a double-double effort of 17 points and 13 rebounds, followed by Rose with 13 points and Roush with six markers. Elizabeth Mullins was next with four points, while Maddy VanMatre and Ashtyn Russell rounded things out with two points apiece. Russell also hauled in nine boards in the setback. Both teams return to TVC Hocking action on Saturday as Southern travels to Federal Hocking and Wahama heads to Miller.